Since the industrial revolution, our economies have grown at the expense of the natural world. But as pressure mounts on the earth’s finite resources, we can no longer pretend that business-as-usual is a realistic option. One way or another we will have to change. The longer we delay, the more our societies will be at the mercy of events and the harsher the eventual adjustments. Fortunately, as this book shows, there is an alternative. 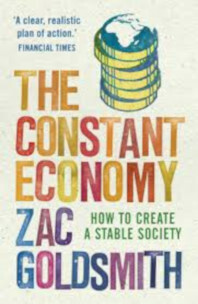 Zac Goldmsith argues for the creation of what he calls ‘a constant economy’. A constant economy is one in which resources are values not wasted, where food is gown sustainably and goods are built to last. It is a system whose energy security is based on the use of renewable sources, and where strong communities are valued as a country’s most effective hedge against social, economic and environmental instability. The constant economy operates at a human scale and above all it recognises nature’s limits. Zac Goldsmith’s landmark book aims to explain and inspire. He shows that almost every action needed to support the environment is already being carried out somewhere in the world, by companies, communiti9es and governments determined to blaze a trail. Where they have done the right thing, their customers and voters have rewarded them. Solutions exist, and they are brought together and set out in this ground-breaking book. First published by Atlantic Books (UK) in 2009. Jonathan Porritt, Founder Director of Forum For The Future.